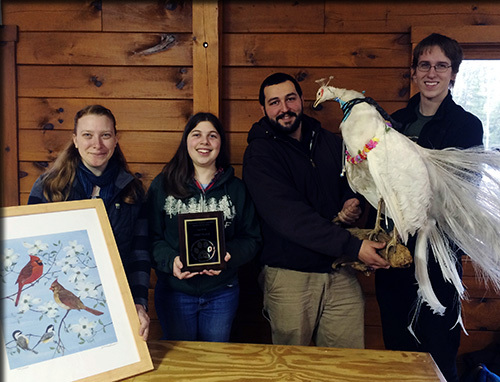 ESF's Wildlife Society Quiz Bowl team won the Quiz Bowl at the Northeast Student Conclave at Penn State in March. The ESF team beat 10 other teams competing in the bowl. Quiz bowl team members are Peter Iacono of Brooklyn, junior, wildlife science; Thea Cooper of Howard Beach, sophomore, conservation biology; Rob Meyer of Buffalo, senior, wildlife science; and Sarah McIntire of Waltham, Mass., senior, wildlife science. Members of ESF's chapter of The Wildlife Society also placed highly in other events including: dendrology competition, second place, Russell Winter of Washington Grove, Md., junior, wildlife science; ornithology competition, third place, McIntire; mammal identification, second and third places respectively, Cooper and Iacono; human dimensions photo contest, first place, Kevin Skrzynski of Buffalo, sophomore, wildlife science. The team also won the New York state Wildlife Society Quiz Bowl held in Oxford, N.Y., beating teams from SUNY Cobleskill and Cornell. The club is advised by Assistant Professor Jonathan Cohen of the Department of Environmental and Forest Biology.